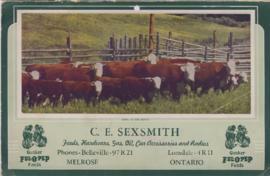 File contains newspaper clips on the c.1922 decline in turkey sales, c.1959 clip on prices of livestock, and Belleville Livestock Sales Co. Ltd. statement and letterhead. File contains c.1967 newspaper clip featuring an image of the Belleville market c.1900's, and a c.1962 clip on the history of the Belleville market place. File contains a newspaper clipping about auctioneer, Cameron Bunnett (born 1914) taking over as President of the Belleville Agricultural Society and becoming in charge of the fair. 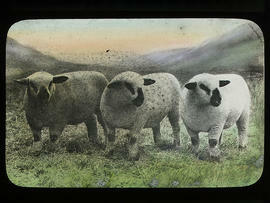 Lantern slides used for teaching agriculture at Belleville Collegiate Institute and Vocational School, Belleville, Ontario, in the 1920s. File contains a newspaper article on the history of cheese-making in Hastings County particularly the Shamrock Cheese Factory, Sidney Township. Cheese industry : Maple Leaf Cheese Co. File contains a newspaper clipping of the recollections of John M. Wilkinson, cheesemaker, and a clipping regarding changes in the cheese-making industry. File contains a four page typescript history of the cheese industry in Central Ontario from 1890-1915 for the Hastings County Museum, as recalled by Chas. B. Meyers, ex-president of the Belleville Cheese Exchange. File contains a two-page typescript photocopy entitled "History of the Cheese Industry in the Belleville and Quinte Area [ca. 1864-1964]. Cheese industry : 1904-33 Sidney Cheese Factory shares. File contains three original printed shares issued by The Sidney Cheese and Butter Factory Association, Limited displaying shareholders names and amounts. File contains a one page clipping from the Canadian Doctor, December, 1966 concerning financial operations of "The Front of Sidney" Cheese Factory ca. 19th century. File contains a thirteen-page newspaper insert entitled "Progress in the Cheese Industry : Black Diamond Cheese Limited." Includes histories of select cheese making firms in Hastings County. Cheese manufacturing / by A. H. Britnell, 1882. File contains a printed booklet entitled A. H. Britnell's Mechanical Method of Manufacturing Cheese. Includes illustrations. File contains the front page of the August 24th 1961 issue of the Family Herald featuring a cider making. Merle Clark discusses going to school in Actinolite, farming and church activities. File contains a newspaper article on the history of the Old Forge Inn farm, owned by four families since 1817.